The smartphone company HTC has announced the release of 2 Windows 8 Devices- The HTC 8X and 8S , as a result of HTC's partnership with Microsoft. HTC will be releasing the Windows Phone 8X and Windows Phone 8S shortly following the official unveiling of the Windows Phone 8 operating system in October. The HTC phone features a 4.2” Super LCD 2 display with a resolution of 1280x720 pixels (341 PPI). The smartphones will come in yellow, red, black, and blue colors. The front of the device is flat with a ring of color (of your choice) while the back and edges are rounded. No specific dimensions were given, but the smartphone weighs 130 grams. Cameras include a 2.1 MP front-facing camera for video calling that is capable of recording 1080p video as well as an 8 MP rear camera. The Processor used in the HTC Phone is the identical Qualcomm dual-core 1.5Ghz Snapdragon S4 processor. Other internal specifications are 1GB of RAM, 16GB of internal storage, and an 1800 mAh battery. Wi-Fi and NFC radios are also present, but the Windows Phone 8X does not appear to support US LTE networks. On the audio side of the phone, HTC has the Beats Audio functionality and an internal amplifier that will allow users to attach larger headphones to the HTC 8X. The HTC 8S, which comes with a 1 Ghz dual core processor, 4 Gb expandable storage, a 5 megapixel camera with 4 inch WVGA screen and no front-facing camera will retail for a ground-breaking 224.98 Inc Vat at launch. The HTC 8X is also going for pretty cheap. Unlocked-Mobiles will be retailing theirs for 398.98 Inc Vat, which is a pretty good introductory price .The handset has a super-sharp 4.3 inch 720p screen, 16 GB of storage and a 1.5 Ghz dual-core processor with a great 8 megapixel rear and super-wide angle 2.1 megapixel front camera. In the U.K., Clove has the HTC Windows Phone 8S priced at £225, or roughly $365, while the 8X carries a price tag of £400, which is nearly $650. HTC has not announced any specific pricing, but both models should be available for purchase in November. 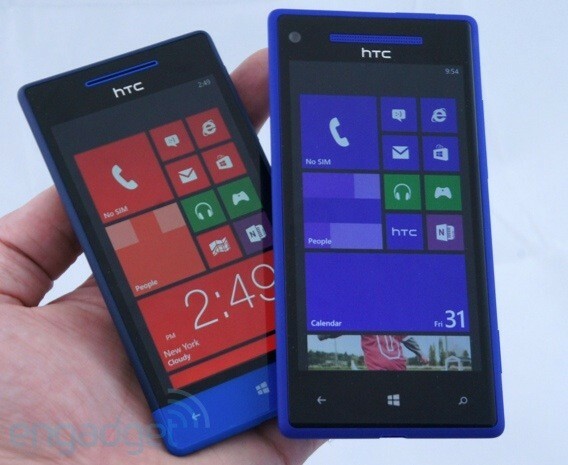 The HTC 8x will arrive in early November and the 8S in mid-November. 0 Respones to "HTC Windows Phone 8X and 8S"